Deafblindness is the condition of little or no useful sight and little or no useful hearing. There are different degrees of vision loss and auditory loss within each individual, thus making the deafblind community unique with many types of deafblindness involved. Because of this diversity, each deafblind individual's needs regarding lifestyle, communication, education, and work need to be addressed based on their degree of dual-modality deprivation in order to improve their ability to live independently. Statistically speaking, it was estimated that roughly 35,000–40,000 United States residents are medically deafblind. 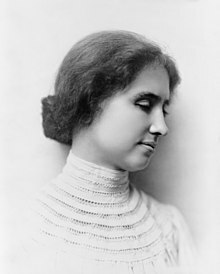 Helen Keller was a well-known example of a deafblind individual. Furthermore, the deafblind community has its own culture, creating a community of deafblindness similar to the Deaf community (see Deaf culture), and the blind community. Each community is made up of a group of individuals who have undergone similar experiences and have a homogeneous understanding of what it means to be deafblind, even with a large diversity of unique backgrounds. Some deafblind individuals view their condition as a part of their identity. The medical condition of deafblindness comes in different forms. For some, this condition might occur congenitally from birth as a result of genetic defect, for others it happens suddenly due to a form of illness or accident that results in a modality deprivation of either vision or hearing, or both. A person might be born deaf and become blind at a later stage in life, or vice versa. In any given case of deafblindness, there are many possible onsets and causes of this condition, some happen gradually, others happen unexpectedly and suddenly. The diagnosis of deafblindness could be medically classified into specific types based on one’s symptoms and causes. There are two overarching types of deafblindness: congenital and acquired. Use of residual hearing (speaking clearly, hearing aids, or cochlear implants) or sight (signing within a restricted visual field, writing with large print). Tactile signing, sign language, or a manual alphabet such as the American Manual Alphabet or Deaf-blind Alphabet (also known as "two-hand manual") with tactile or visual modifications. Interpreting services (such as sign language interpreters or communication aides). Communication devices such as Tellatouch or its computerized versions known as the TeleBraille and Screen Braille Communicator. Multisensory methods have been used to help deafblind people enhance their communication skills. These can be taught to very young children with developmental delays (to help with pre-intentional communication), young people with learning difficulties, and older people, including those with dementia. One such process is Tacpac. Braille equipment includes a variety of multipurpose devices, which enhance access to distance communication. Some can be used as stand-alone devices connected via Wi-Fi, while others are paired with a mobile device to provide tactile access to e-mail, text messaging, and other modern communication resources. To receive Braille equipment, an eligible consumer must be proficient in Braille and must have access to the Internet or cellular service. The Telebraille does not have a computer communications modem but does have a TTY (TDD) modem. It was designed as a TTY for deaf-blind people and is also useful for face-to-face conversation. It has two components. The sighted component is a modified SuperCom TTY device. It has a qwerty keyboard and a single-line LED display. The display is regular size and is not particularly suited to people with low vision. The SuperCom TTY can be connected directly to the telephone line using a conventional telephone jack or the telephone receiver can be coupled to the SuperCom on a cradle on top of the device. Text flows past the display in a continuous stream, like tickertape. The SuperCom is connected to the Braille portion of the device by a cable that is about two feet long. The Braille display is about 15 characters in width, although there is a knockout to allow additional characters to be installed, at considerable additional cost. The Telebraille is able to communicate in ASCII mode but is not compatible with conventional computer modems. There is what looks like a RS-232 socket on the back of the Braille component, but the instructions for the Telebraille state that this jack is for "future use" and that no computer devices should be attached to it. A graphic Braille display can be used in sensing graphic data such as maps, images, and text data that require multiline display capabilities such spreadsheets and equations. Graphic Braille displays available in the market are DV-2 (from KGS ), Hyperbraille, and TACTISPLAY Table/Walk (from Tactisplay Corp.). For example, TACTISPLAY Table  can show 120*100 resolution refreshable Braille graphics on one page. This video shows operation of the device. The 1959 play The Miracle Worker, and its film adaptation released in 1962, recounts Annie Sullivan's efforts to draw Helen Keller from her world of blindness and deafness. The Bollywood movie Black, featured Rani Mukerji as a deafblind character named Michelle McNally. The Who album Tommy tells one continuous life story about a deafblind boy named Tommy through songs. Haben Girma, the first deafblind individual to graduate from Harvard Law School, set out to make a difference in society for those with disabilities. Wikimedia Commons has media related to Deafblindness. ^ Keller, Helen (1938). Helen Keller's Journal, 1936-1937. Garden City, NY: Doubleday, Doran & Co.
^ Kudlick, Catherine; Nielsen (2005). "Kim". Journal of American History. 4. 91 (Review of the Radical Lives of Helen Keller). ^ a b Dammeyer, Jesper (November 2014). "Deafblindness: a review of the literature". Scandinavian Journal of Public Health. 42 (7): 554–562. doi:10.1177/1403494814544399. ISSN 1651-1905. PMID 25114064. ^ a b Deaf-Blindness, NCDB: National Center on. "Overview on Deaf-Blindness". nationaldb.org. Retrieved 2018-03-27. ^ "NCDB Selected Topics: Deaf-Blindness Overview". Nationaldb.org. Retrieved 2012-03-04. ^ Deaf-Blindness, NCDB: National Center on. "Culture and Community". nationaldb.org. Retrieved 2018-03-27. ^ "Identity – DeafBlind Connection – Minnesota State Academies". www.msa.state.mn.us. Retrieved 2018-03-27. ^ a b "Conditions/Syndromes | Deafblind Information". Deafblindness Support Services. Retrieved 2018-03-27. ^ a b "Causes". nhs.uk. Retrieved 2018-03-27. ^ Heller, Kathryn; Kennedy, Cheryl. Etiologies and Characteristics of Deaf-Blindness (PDF). National Center on Deaf-Blindness. pp. 36–74. ^ "HKNC: Common Causes of Combined Vision and Hearing Loss". www.helenkeller.org. Retrieved 2018-03-27. ^ "Home of KGS Corporation". KGS Corporation. ^ "Home of Tactisplay Corp". Tactisplay Corp.
^ "Full Page Braille Display being Launched by Tactisplay Corp". Tactisplay Corp.
^ "The Miracle Worker (2000)". imdb.com. Retrieved 2017-12-23. The National Center On Deaf-Blindness Official informational website on deafblindness in United States. The Helen Keller National Center for Deaf-Blind Youths and Adults Helen Keller Services website catering for the deaf-blind and blind communities. World Federation of the Deaf-blind Website for worldwide information concerning deafblindness. Able Australia Informational website on deafblindness in Australia. "Haben Girma Homepage" About Haben Girma, the first deafblind Harvard Law School graduate. This page was last edited on 7 April 2019, at 23:13 (UTC).